Do you want to represent the Philippines in an international English Competition? 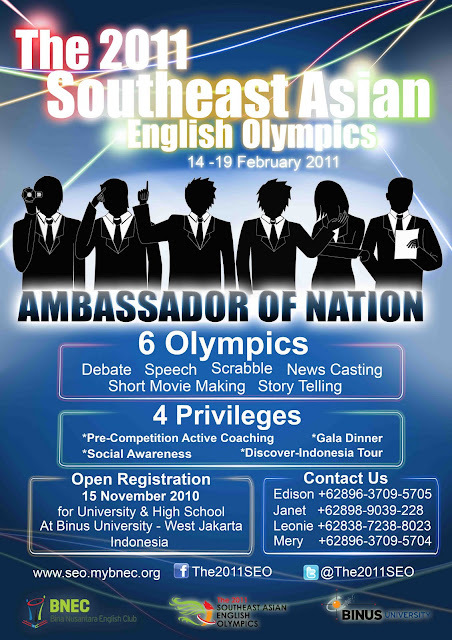 The Bina Nusantara English Club (BNEC), a student organization from Binus University, is inviting students from the Philippines to take part in the biggest English competition in the ASEAN region - the 2011 Southeast Asian English Olympics. The olympics will be held from February 14 - 19, 2011 in Binus University, Jakarta, Indonesia. Students from Green Valley College and St. Alexius College are already preparing their respective teams for the international competition as they are expected to compete against more than 500 students from the different parts of the ASEAN region. The olympics is open to both high school and college students which will compete in 6 categories (storytelling, debate, speech, scrabble, short movie making, and newscasting). Other Students from South Cotabato, Sultan Kudarat and Saranggani are invited to join the competition as registration is still open. School Administrators, Principals, and Department Heads (English) can coordinate with Mr. RJ Sustiguer to get official invitation letter and registration pack or check out the official website http://seo.mybnec.org and coordinate with the organizers directly.